Having finally recovered from the hatchet job that school dinners did on cauliflower cheese (it's taken decades, mind), I now relish the thought of it. 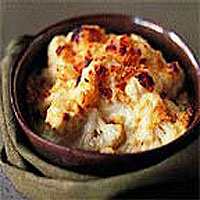 There is something so very right about just-cooked tender cauliflower in a creamy sauce with a good measure of Cheddar. Preheat the oven to 200°C, gas mark 6. Cook the cauliflower in boiling salted water until just tender - 5-6 minutes but no more. (Don't underdo it either - crunchy, al dente cauliflower is not right for this dish.) Drain thoroughly. Grease the sides and edges of an ovenproof dish that is large enough to take the cauliflower in a closely-packed single layer, then tip the cauliflower in. To make the sauce, melt the butter in a medium-sized pan. Spoon in the flour and stir for about 1 minute, without allowing it to brown. Remove from the heat and gradually beat in the milk, a few spoonfuls at a time at first, then increasing the flow as the sauce thins. Return to the heat and simmer gently for about 10 minutes, or until the sauce is thickened and creamy. Stir frequently to prevent the sauce from catching on the base of the pan. Remove from the heat and stir in three-quarters of the Cheddar with the crème fraîche or cream, and the mustard. Season with nutmeg, a little salt and lots of pepper. Taste and adjust the seasoning, making sure that it is fairly punchy. Pour the sauce over the cauliflower. Mix together the breadcrumbs and the remaining Cheddar, then sprinkle evenly over the cauliflower and sauce. Bake for 25-30 minutes, or until browned and bubbling. Serve immediately.